I still can’t believe this actually worked! It really looks like a turtle. If you are new to my blog, I have been experimenting with bread art for awhile now, its pretty much hit or miss but I have been learning some techniques to help make it err more on the hit side. My inspiration for this came from the tortoise that my 3 year old son colored in his Easter coloring book. I watched him taking his time, focused on holding that crayon the right way and applying the color in all the right places and I couldn’t stop my brain from analyzing how I would turn that pretty turtle into a loaf of bread. I know, I know… I have lost my mind. If you are a food blogger you probably know what I’m talking about… blogging is always on the brain. Moving on… some of the steps for making this silly turtle. Allocate your dough, color it. This is my least favorite part. It’s why I choose subjects with few colors. I like cocoa because its more natural. Form the turtle head. I wanted a nose shape so I made sure the eye was not in the middle. Lots of rolling and wrapping. The eye has got to be the thinnest possible. Fresh baked loaf. After so much work went into making this, you can imagine how it would feel to slice it. My little guy stands next to me and we are both beyond excited to see if the experiment worked or failed. Even if it didn’t look anything like a turtle… a 3 year old is very easy to please. He was doubly pleased when he realized that the picture he colored for me was the inspiration. 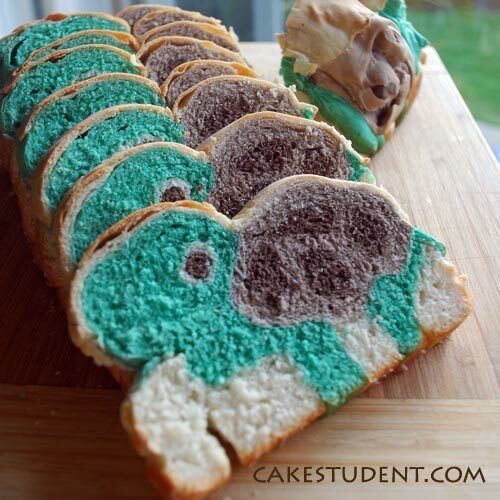 For complete steps for this turtle bread and many others, check out my new eBook! Separate into 3 dough balls. For the brown colors, start with 1 dough ball, place in an electric mixer with the dough hook attachment. Add a little cocoa powder and mix… repeat until you the right light brown color and dough is even (you can knead by hand to help). Then divide that brown dough into 2 balls. Take one and make it even darker by adding more cocoa powder and knead by hand or use mixer again until color is even. Wipe clean the mixer. 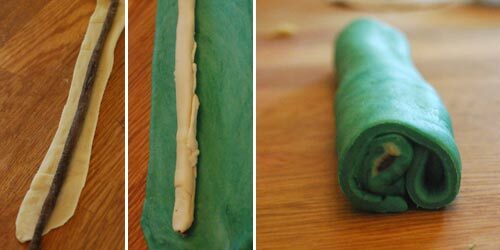 Add the next dough ball to the mixer and add green coloring, mix and knead until you get the desired green color. Wow this is so awesome!!! It looks like Squirt from Finding Nemo Love your blog! OMG these are so cute!!!!!!!!!!!!!!!!!! Oh my gosh, this is adorable!!! I’m so impressed by your imagination and skills – I’d never be able to come up with anything like this! omgosh! I thought I was cool baking stars and hearts into cake, but this is a new level of awesome. I am in awe – it looks fantastic!! Great job!! This is seriously so cool! You are so talented! Sorry you didn’t care for it Monika, I knew some people would think its crazy. Give it a try Mel, you’d be surprised, I never did either! Same here Winnie, love colors. Definitely checking out your site Stefany, sounds like fun! Saw this on Tastespotting on facebook and I knew it was you! Sooooo cute! Haha! Thats funny, I never told you Brooke, but I made the batman cheese cutout on top of my bean soup the other day and my son thought it was sooo cool. Thanks for stopping by again! I’ll have to make this for my sons (in their 20′s now), it reminds me of one of the poke mon they always played with. What a cute idea! It will make some fun sandwiches for them… good luck Toni! Absolutely amazing! You are giving I am Baker a run for her money! Ok Jenny, so after reading your comment I spent 45 minutes on her site Ummmm, I will be making cupcakes today. This is fantastic! Great job, I don’t think I’d have the patience to pull this together. I admit It does take some time, but its a good activity for a slow day. My 3 year old likes to play with the dough as if it were play dough so we are both happy. Thanks for visiting Jess! Wow, I have to commend you on your patience and skills to make this. It is absolutely beautiful. Thanks Chung-Ah, every loaf I make it gets easier! Thanks Stephanie! 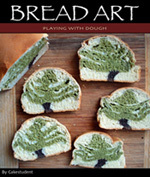 I just checked out your site and love the huge buttermilk oatmeal bread, wow! I just made my own and it’s so cute!!! Thanks!!! Thats fantastic! If you took a picture and want it displayed let me know, I was thinking about starting a new section on my site that features what people have made. Thanks for stopping by Katie. I made this today with a two year old, we didnt wrap the individual rolls inside the shell as patience is low with toddlers lol but we gave it a go and it considering we just threw it altogether i was soooo suprised it actually resemble a turtle when we cut the first slice! we had a lovely lunch, shared some out and ive frozen some as well. definately goin to make more as his little face lit up thank you! 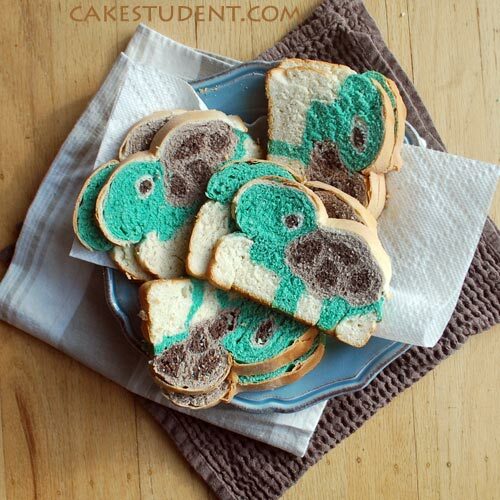 have you made butterfly bread? i love your turtle and your rainbow i will be trying that out. Not yet, but the idea had crossed my mind. I actually just finished ladybug bread and will be posting that in the next day or so. Thanks for leaving a comment, I think butterfly bread will be next on my list! I have been baking bread with vegetables baked into them for a little while, and have been wanting to experiment with a “rainbow” of colours to allow for different vegetables to be “packed” in without kids knowing. I have tried making a rainbow & a happy face using beet dough (red/pink), blueberry dough (purple), spinach dough (green), I faked the blue dough with some food safe dye, but I am going to try using some red cabbage for the blue (at some point). I have many friends who are interested and intrigued by the concept of sneaking some veg into the bread, and so far the kids are not objecting to the flavour, so it is a great way to naturally colour the bread & get some veg in at the same time. I was thrilled to come across your site, as it gives me some more great ideas for shapes, and configurations. Thank you Shelley, I was planning on converting it into a different format and now I know someone is interested in that I will start work on that soon. I promise to let you know when its available! Thanks for stopping by my site. 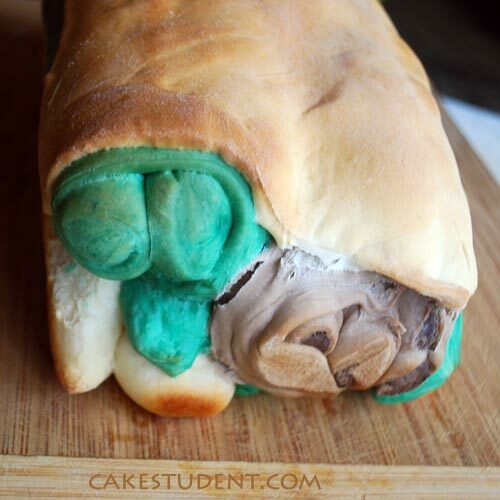 I love how you use veggies for food coloring that is truly ambitious. I wish I could try some of your bread! I was just looking through images online looking for something else and saw this. I just have to say it’s AWESOME. 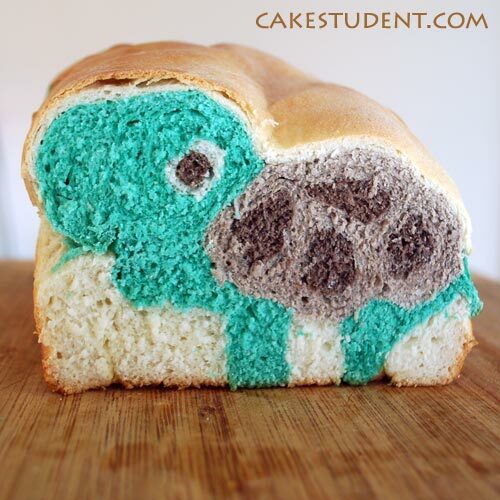 I love turtles and I wish they sold this bread when I was a kid. I love it love it love it. So happy you liked it, Nicole! This might be my favorite bread too.